So wait, what about Myst? The first of many phones to get Facebook Home? Buffy, Myst, and now First? The supposed Facebook phone by HTC is certainly running through the rumored names. @evleaks, a normally reliable Twitter tipster, today posted an image of a phone with "htc first" emblazoned across the screen. First is styled in Facebook-esque font, while it's written in the social network's signature blue. All that @evleaks has to say about the phone is: "HTC first, 2013." Powers of deductive reasoning seem to suggest that this is a Facebook phone we could see Thursday, though all may not be as it seems. 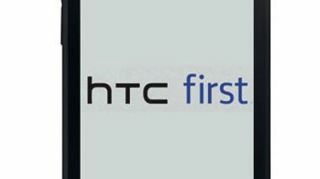 Some analysis conducted by The Verge discovered that the HTC First logo was likely PhotoShopped onto the image (you can also see a faint line bordering the words, as well). There's also little in the way of distinctive markings to say whether this is an HTC phone - or device made by any specific manufacturer - or simply a generic rendering. You may remember that before the Galaxy S4 was announced, an image supposedly of the phone popped up online (posted by @evleaks, no less) before it was found that it was merely place holder for the real deal. The same may be true for this pic, though perhaps it does reveal the actual name of the device said to house "Facebook Home." What's more, the First image lines up with descriptions published by 9to5Google; that the phone would resemble a slightly larger iPhone 5 with capacitive buttons along the bottom. Monday, a report indicated the phone, up until now know as the Myst, would own a 4.3-inch screen. We don't know about you, but all the leaks and titular options are making for quite the head-spinner. TechRadar can't wait to get situated in Menlo Park Thursday so we can get to the bottom of all the rumors.